Regarded by his peers and critics alike as the king of the Hammond organ. His recordings are extensive, with over 30 albums for Blue Note and 20 for Verve, and some recent Milestone recordings. The Sermon, Back At The Chicken Shack and his collaborations with Wes Montgomery are often considered his best albums. He recorded in trios/quartets/quintets, sometimes sharing the billing with guitarists and saxophonists (Stanley Turrentine). He also recorded with big bands (most Verve releases), unfortunately. After his first four albums, A New Sound-A New Star & The Champ and two live, he recorded five (count 'em: 5) albums in three days in five different ensembles including Donald Byrd, Lou Donaldson, Art Blakey and Kenny Burrell. The albums A Date with Jimmy Smith Vols. 1 & 2, Jimmy Smith At The Organ Vols. 1 & 2, and The Sounds of Jimmy Smith are collected on a 3-disc chronological compilation from Mosaic The Complete February 1957 Jimmy Smith Blue Note Sessions. Home Cookin', recently available from Japan, is more late 50's recordings with his faithful and esteemed guitar partner Burrell, who's own Midnight Blue with Stanley Turrentine is a Blues-drenched Jazz guitar classic. Smith made his share of funky grooves. Suggestions are "Can't Get Enough" (from his Paid In Full album on his Mojo label, NA on CD) which can be found on the compilation of the same name from the Luv N' Haight label ("The Finest In Funk Since 1990", a tongue-in-cheek take-off of Blue Note's "The Finest In Jazz Since 1939", both of which are two of my favorite labels). Another classic is "Pipeline" (album?) which is on the Best Of compilation from Curb (not the best!). He was awarded Downbeat's Top Jazz Organist for the first of many times in 1964, the same year he won a Grammy for his album The Cat. This album, from his Verve years, is characterized by orchestral accompaniments which are some of the unfunkiest things I have ever heard. The amazing thing is that if you just listen to the organ and shut out the big band, it's still funky. He's still touring regularly, and one of his recent concerts in Tokyo was released by Blue Note, The Master, with Kenny Burrell on guitar and Jimmie Smith on drums. January '94's Downbeat magazine has a feature article "B-3 Jammin' with Jimmy Smith" with some interesting insights: Groove and McGriff used to be pupils of Smith's and would hide secrets from each other... According to Smith, they would wake him up in the morning. Smith himself would get to Bud Powell's home before he got up so he could watch him practice. Powell welcomed him until Jimmy played him "Un Poco Loco"! Smith even played a Charlie Parker gig one night (of many it seems) Powell was late. 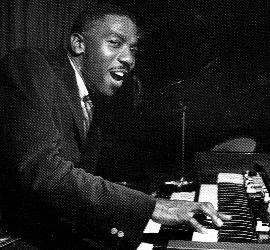 Jimmy Smith's newest recordings on Verve, Damn! and Angel Eyes, matched him with today's "hot" young Jazz players: Roy Hargrove, tp; Nicholas Payton, tp; Mark Whitfield, g; Christian McBride, b. Another discography (zipped, 9KB) by Marco Montaruli in Excel spreadsheet format.